My husband and I spent pretty much the entire weekend in swimsuits, walking along the beach, napping in the warm sun, and dining out around where we were staying in Pismo Beach. That’s why, once Sunday rolled around and we were back home, I was feeling a little winded but ready to cook something simple, summery and fresh. For our Sunday spread, I laid out a tangy Chicken Tortilla Soup with avocado and lime and this subtly spicy and moist cornbread to go along with it. Easy, delicious and… well, not the route I’d typically go on the first 82-degree day of the year (Popsicles for dinner, anyone?). Thankfully, I only needed to fire up our little toaster oven to 375 degrees for a perfect cornbread, but we had all the windows open just in case any heat escaped! The jalapeño cornbread made for a mild but oh-so-scrumptious side dish to the spicy soup, and the honey-lime butter was a very fresh and light spread. The best thing about this cornbread is that you can easily omit the jalapeños altogether and it would still be delicious! Add batter to a greased 8-inch baking dish and smooth out the batter. Bake for about 35 minutes, or until top is golden brown. Prick the center with a toothpick and make sure it comes out clean. If not clean, bake for about 5 more minutes. This looks DELICIOUS. And I’m jealous of your weather! Yum! This is just my type of food. And a fried chicken and I am in heaven! Thanks for the kind comments, everyone! There’s plenty left over – I wish I could mail some to you all! Oh yeah I am making this cornbread this weekend. Thanks for the recipe. This looks wonderful and as I’m a sucker for lime, sweet & spice together this is right up my alley. Thanks for finding my blog and I’m thrilled to have found yours, you have some great recipes. Love the addition of the honey lime butter! Definitely on my list to try! This was so good, made it for dinner last night with your jerk chicken for my husband and his friend. It was a huge hit. I also make that citrus chicken with the rosemary and sea salt parker rolls last week for a family b-day party and everyone was raving. You will be a new go to site. Thanks for the easy but very impressive recipes. 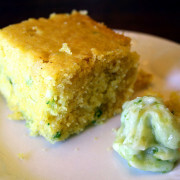 Could You Please Post Your OriginaL Jalapeno Cornbread Recipe With The Honey Actually In The Batter? Its So Good! Hi any way this could be gluten free? It sounds delicious. Which type of flour would be best to substitute?